Saturday Night Live returned last night for its 42nd season of sometimes-wobbly political satire and celebrity impressions. Lucky on both counts then that SNL guru Lorne Michaels (reportedly at the urging of his former employee/Baldwin’s former boss Tina Fey) dug into his “super famous friends” file and persuaded 16-time SNL host and noted politics junkie Alec Baldwin to take over as the show’s Donald Trump. Taking on Kate McKinnon’s supremely confident Hillary Clinton in a cold-open debate sketch, Baldwin’s be-wigged and suitably orange Trump hit all the expected targets from last week’s debate—the sniffing, the belligerence, the rambling, the inexplicable, unprompted personal attacks on comedians who once said mean stuff about him. Meanwhile, Baldwin put his own stamp on the Republican candidate, perhaps channeling some of his own, well-documented prickliness as he confidently and incorrectly asserts that he is winning the debate at all times, regardless of the fact that Clinton cedes her time to him at one point just to see if he’ll bury himself further. “The thing about the blacks…” he begins immediately, leaving McKinnon to gape in wonder at her good fortune. While farming out one of the season’s most central recurring impressions to a ringer like Baldwin might indicate a lack of confidence the regular cast, Michaels is, no doubt, thinking of the overwhelming popularity of Larry David’s Bernie Sanders last season. (David popped up as Bernie last night, too, taking on Trump supporters in a campaign-themed Family Feud sketch.) 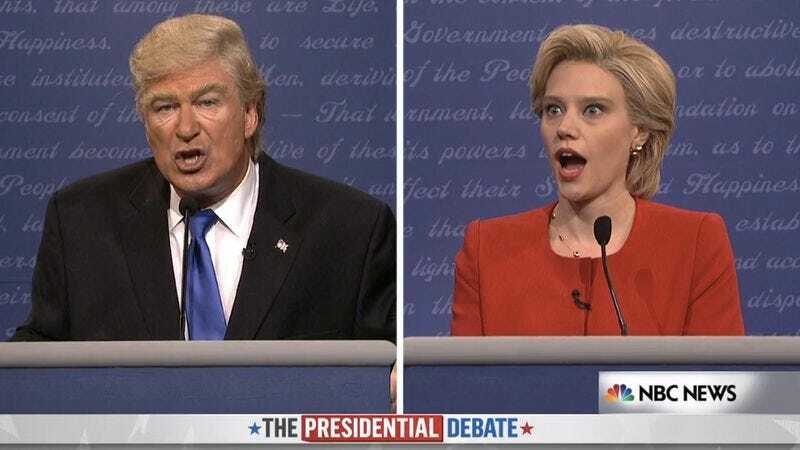 Regardless, as long as the real-world Trump keeps delivering debate performances like his first, all the SNL writers will have to do is get a hold of the transcript, slap a hairpiece on the clearly game Baldwin, and turn him loose.